Janet Inez Adams, MFA has seven art pieces in the current (September – October 2017) STRINGS ATTACHED Invitational Exhibit at Coastline College Art Gallery. This exhibit was curated by David Michael Lee, Director. WISHBONE AND THE FIRE 2017 – mixed media. Retells the tale of the terrible fire in Brian Head, Ut, that scorched 76,000 acres near the Dixie National Forest and threatened Janet’s cabin. FRIEND OR FOE 2014 – mixed media on wood. A dream image. WEB AND GREEN GATE 2015 – mixed media on wood. A story. WISHBONE AND THE FIRE 2017. 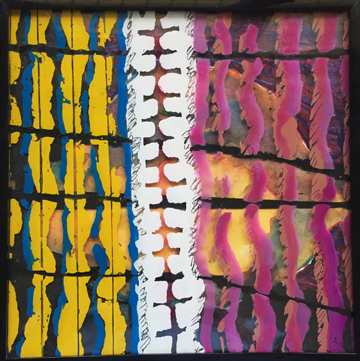 GIFT OF RAIN 2014 – mixed media on wood. Created during the draught in hopes of bringing rain. CROWN 2014 – mixed media on wood. Refers to “Crown of Thorns”. FOREST FOR THE TREES 2012 – mixed media on wood. Refers to the mysteries found in a forest. WISE OLE SOL 2010 – mixed media on wood. A joke about the sun. The design of my wall for STRINGS ATTACHED 2017. On November 5, 2016 from 6 to 10pm, the following SCA members will be exhibiting in ART START at OCCCA. All accepted art works are for sale. The show continues until December 10, 2016. Please come to the reception on Saturday, November 5, 6 – 10pm.